WASHINGTON, USA -- The Permanent Council of the Organization of American States (OAS) has approved a declaration in support of the government of Haiti following the country's decision to hold legislative and municipal elections before the end of the year, during a regular meeting held at the headquarters of the hemispheric institution in Washington, DC. 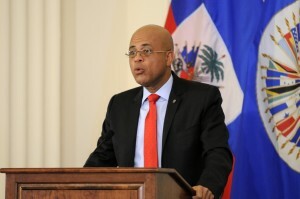 The Council also expressed its support for "the process of national dialogue underway, which contributes to the stability of democratic institutions and the consolidation of the rule of law in Haiti.” The declaration also urges all branches of government and stakeholders to continue said process of national dialogue and to implement as a matter of urgency the provisions of the El Rancho Accord. The interim representative of Haiti, Edmond Bocchit, thanked to OAS General Secretariat and all member states for adopting this declaration. "President Michel Martelly and the Haitian cabinet have supported a process of dialogue in an inclusive and democratic manner to act accordingly. Today’s support of the electoral process is something we value," said the Haitian diplomat.